Fauna & Flora International (FFI) conservationists recently announced the intriguing discovery of a new species of carnivorous pitcher plant in the dense forests of Cambodia’s Cardamom Mountains. The plant’s story highlights the rich biodiversity and important ecosystem services of one of South Asia’s last intact wilderness environments. As the name suggests, the Cardamom mountains are a source of supply for the spice by the same name that is popular in Thai and Indian cuisine and is still grown commercially in the region. The mountain range runs alongside the Gulf of Thailand on Cambodia’s southwestern border, stretching from the southern Cambodian city of Kampot all the way to Thailand and covering an area of roughly 1,870,000 hectares. Route R1 from Bangkok to Phnom Penh skirts the region’s northern boundary. Dramatically different climates characterize the vast area encompassed by the mountains. The wet western slopes of the Cardamoms nurture lush tropical rain forests (also known as a tropical moist broadleaf forest eco-region) and give rise to Cambodia’s highest peak, Phnom Aural, with an elevation of 1,823 meters or 5,948 feet. The area near the Bokor Hill Station in the Elephant Mountains that stretch into Thailand receives 150 to 200 inches (3,800–5,000 mm) of rain each year. On the drier, wooded eastern slopes of the Cardamom Mountains where cardamom and pepper are still grown for sale, only 40 to 60 inches (1,000 to 1,500 mm) fall in places like Kirirom National Park. As one of Southeast Asia’s last intact forest wildernesses, the Cardamom Mountains are home to an impressive array of diverse, native organisms. Ecologically blessed with fertile conditions for plant and animal life, they were enthusiastically described as a “treasure chest of new species” by the British photographer Jeremy Holden, who first uncovered the exotic new pitcher plant on a survey for FFI. The Cardamom Mountains and forest cover support an abundance of exotic, often endangered species, many of which are endemic to Cambodia. They play home to one of the largest populations of Asian elephants in Indochina and have been recognized as a Level I Tiger Conservation Unit. Other unique native species include the pangolin, or scaly anteater, the only mammal to have adapted an outer covering of large keratin scales. The IndoChinese Tiger, Clouded Leopard, and Malayan Sun Bear are just a few examples of the area’s multitude of threatened species. Irrawaddy and humpback dolphins inhabit the area’s rivers, along with the last known population of very rare Siamese crocodiles and the nearly extinct batagur baska or Royal Turtle. Some of Cambodia’s hairy-nosed otters (shown below wielding a tasty morsel like a cigar) may also make their homes in the Cardamom rivers and forest. In addition to the pitcher plant, other recent discoveries of new species in the Cardamom Mountains include a green-blooded frog. The newly discovered red and green pitcher plants were named Nepenthes holdenii after photographer Jeremy Holden. The pitcher shapes are actually formed by modified leaves that the plants use to capture and digest insects. One of Holden’s eye-catching pictures of the instrument-like plant appears below. There are several large groups and numerous species of pitcher plants. 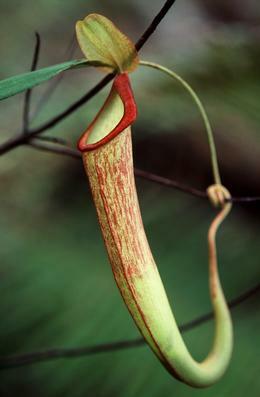 Carnivorous pitcher plants like the one shown above feature a deep, prey-trapping cavity known as a pitfall trap. Only several species of pitcher plants are carnivorous, making Holden’s and IFF’s discovery all-the-more remarkable. The carnivorous Nepenthes holdenii have adapted to survive during the long periods of droughts and fires that are common in the drier, eastern parts of the Cardamom Mountains. They take advantage of clearings in the forest that are caused by the frequent fires by generating a large, underground tuber that sprouts a new, pitcher-bearing vine after the fires have died down. By consuming insects, the pitchers obtain more nutrients that help them compensate for impoverished soil caused by the fires. The Cardamom Mountains have also played an important part in Cambodia’s human history. In addition to sheltering plant and animal life, the Cardamom mountains served as the last refuge and stronghold of the vilified Khmer Rouge. Many Neolithic “jar sites” are also scattered around the mountains. The 60-cm high jars hold the remains of deceased residents of the area who were Cambodian royalty according to local legends. The natural habitat and biodiversity of the Cardamom Mountains provide a variety of highly valuable ecosystem services to the people of Cambodia. The Cardamom Mountain plateau is the source of several of the nation’s most important rivers and the primary watershed for one-third of Cambodia. As inhabitants of one of the poorest countries in Asia, many Cambodians rely on the land and their immediate environment to feed their families and eke out a living. The forest protects the headwaters of major rivers that feed the rice fields and fishing grounds of Cambodian farmers and fishermen. While the remote, mountainous nature of the region has helped to preserve and protect the area’s diverse plant and animal life, ecological threats from private industrial interests remain all-too-real. Deforestation poses one of the biggest potential dangers to conserving the Cardamom forests’ biodiversity and natural ecosystems. 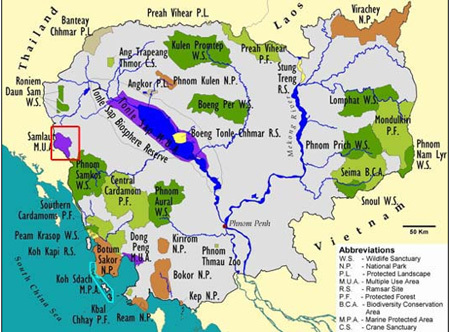 Nearly all of the Central Cardamom Mountain Range has been granted to logging concessions. The mountains are also increasingly vulnerable to illegal logging, wildlife hunting, forest clearing, and land encroachment. The sale of a single tiger carcass could bring a Cambodian farmer 250 times his monthly salary. The active involvement of concerned organizations and individuals can help raise awareness about the natural beauty and benefits of the Cardamoms and make a difference in the success of local conservation efforts. Conservation International’s Conservation Stewards Program works with partners in the Cambodian government to protect the forest life and ecosystem by empowering local communities. The program helps local residents develop sustainable livelihoods that offer a viable alternative to slash-and-burn agriculture and wildlife trapping. If you’re interested in seeing a pitcher plant in the flesh or investigating the still largely unspoiled environs of the Cardamom Mountains for yourself, you can check out a growing variety of ecotourism options. The Wildlife Alliances Chi Pat ecotourism area opened in the southern Cardamoms in 2007. Various tourism service providers facilitate a range of activities in and around the area, including trekking, diving, mountain biking, bird watching, and boat cruises. You can learn more about as well as help contribute to the discovery and conservation of rare and endangered species around the world by visiting the websites of Fauna & Flora International and Conservation International. Alford, Henry. Banishing the Ghosts in Cambodia. New York Times. Cardamom and Elephant Mountains (Cambodia). Asian Development Bank (ADB). Carnivorous Plant Found by Cambridge Conservationists. BBC News. November 15, 2010. Foges, Rebecca. New Species of Carnivorous Plant Discovered in Cambodia. Fauna & Flora International (FFI). November 12, 2010. MacLennan, Alex. Rare Otter Rallies Conservation in Cambodia. Conservation International. July 2, 2008. Southwest Cambodia Overview. Global Wildlife Conservation.